on this website by mail order! Cooking for a food allergy diet can be daunting. How can you keep up with everything you need to do? 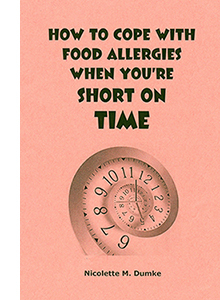 How to Cope With Food Allergies When You’re Short on Time gives advice that will save you time in the kitchen. It helps make meals quick and easy, and you will discover how to spend less time baking and not need to bake as often. It also includes time-saving recipes for main dishes, side dishes, and desserts. $4.95 for an emailed copy of the PDF of this book, which you will receive as soon as we get your order. No shipping charge! Get either book FREE with the purchase of any TWO items on this website by mail order! Your choice of the paper book or PDF with the purchase of any two books here.